Record 320 lb. Halibut landed at Langara Island. A huge 7' Halibut was landed by two lucky anglers from Sacramento CA. While fishing at Langara Island, located at the north western tip of the famous Queen Charlotte Islands. Doug Lavallee and Frank Prigley had heard endless stories of trophy King Salmon and giant halibut from British Columbia's legendary hot spot. The pair of life long friends and fishing partners had been planning their trip of a life time for 5 years before they decided it was time to try for a trophy halibut, something not available in their home waters and the highlight of their dream. Their anticipation built as the Union Jack skipper Bob Jordan instructed them on the proper location, tide, technique and depth before heading out to the famous Langara Lighthouse. Doug and Frank started their drift at about 100 feet and drifted twice to about 160 feet where they retrieved their jigs and moved back to the start of the drift. On the third drift Doug felt a sudden pull and his rod doubled over, "Initially I thought I had bottom and tried to pull it off with all my might when all of a sudden the beast ripped about 20 yards of line off the reel, almost pulling me over. I knew now this was a big fish. I sat down, put my feet against the gunnel and started pumping the rod. I pulled till my arms shook and when I would get 20 feet of line she would take it right back." "It took about a half hour before we could see the beast below the boat, the spear was tied off to the skiff and Frank stood poised knowing he had one chance. He hit perfectly. The 7' halibut immediately tried to sound and Frank yelled 'I can't hold on.' I said 'it's tied let go', the fish pulled the boat 180 degrees and about 20 yards." The fish was too large to bring into the boat and was so long they tried for fifteen minutes to get a rope around the tail before calling over Neil Goodwyn, the Union Jack guide who helped gaff, tie and secure the tail to the stern while tying the head to the bow and bleeding the monster to subdue her for the ride back to weigh-in. The fish was too large and heavy for the scales so the two excited, very tired, anglers anxiously waited while Bob Jordan professionally filleted the fish and weighed the pieces individually. The scene was tense as the carcass and head weighed in at 150 lbs. When the monster's final tally hit 320 lbs. it completely surprised everybody, setting a new B.C. 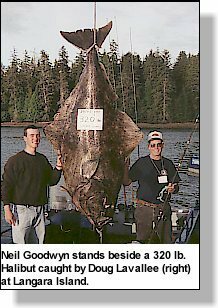 record for the heaviest halibut caught on rod & reel. Doug was using a 8 ounce lead head jig with a white scampi-tail on 130 lb. test line. In the words of Doug Lavallee "This is a dream come true with one problem, . . .I got to figure out a way to come back." Westwind Tugboat Adventures has 24 years of customer satisfaction and are true to their motto "Follow the Fish". They move daily, fishing the hots spots of B.C., keeping anglers at the right place at the right time. For more information on this one of a kind adventure contact: Westwind Tugboat Adventures at (604) 270-3269.